I am not the right person for romance novels, let alone love triangles. But I thought these short stories were great and for sure something everyone should read a couple of. I give Three Sides of a Heart edited by Natalie C. Parker four out of five hearts. 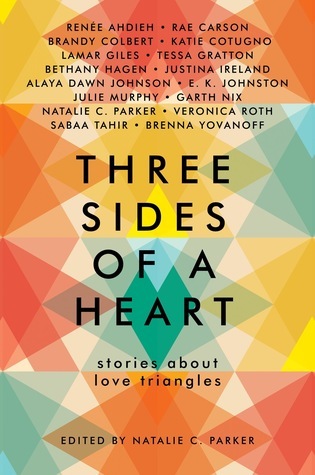 I am one of those people who heat love triangles, but I actually liked these short stories. Every one of these romances is great. Each author kept to their own specific genre to write a love triangle in, which made it great. Not all were my favourite but mostly I liked them. I am not sure if these short stories have changed my view on the love triangle, but it was a good attempt at fixing the stigma on love traingles. Overall this book full of love short stories is full of great stories, so are a bit less nice than others. But they were great none the less. This entry was posted in Book Review and tagged Alaya Dawn Johnson, Bethany Hagan, Brandy Colbert, Brenna Yovanoff, Contemporary, Dystopia, E.K. Johnston, Fantasy, Garth Nix, Julie Murphy, Justina Ireland, Katie Cotugno, Lamar Giles, Natalie C. Parker, Rae Carson, Renée Ahdieh, Romance, Sabaa Tahir, Science-Fiction, Short Stories, Tessa Gratton, Veronica Roth. Bookmark the permalink.